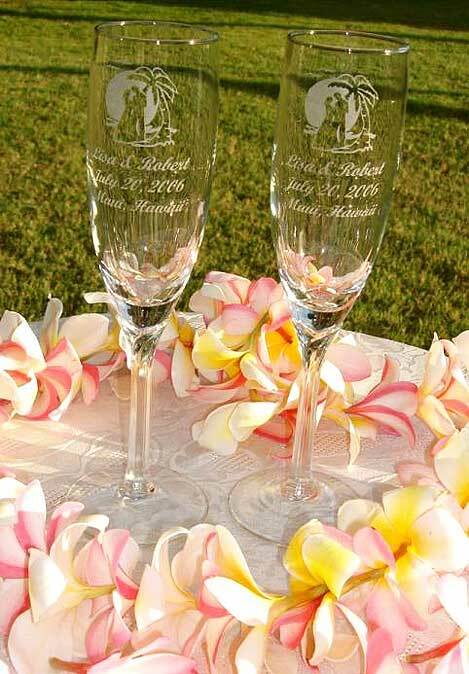 West Maui Engraving offers customized diamond tip computerized engraving for all your wedding needs... jewelry, wedding bands, rings, pendants, charms, cake servers, beautiful champagne flutes for toasting, champagne & wine bottles, wine glasses, bridal gifts. We engrave glass, acrylic, plastic, brass, aluminum, steel, wood, almost anything. We provide our customers with quality products at a great price in a friendly environment. Your items can usually be engraved within 24 to 48 hours. Bring in your own items or purchase items from our wide selection. We can engrave your wedding rings with a personal inscription. Please give us a call at 808-661-7035 and we'll help you come up with unique and creative ideas that will transform that special gift into a family heirloom... the possibilities are unlimited! We look forward to serving you soon. Please call for an appointment 808-661-7035.